Rameshwor Raya Yadav, a Madhesi leader, responded to the recent Constitutional Amendment Bill endorsed by the Parliament as “positive to some extent” but still “it does not address the demands made by the agitating Madhesi parties in their entirety.” By terming the two amendments as incomplete, the Madhesis are closing the door on any possible compromise. Why are the Madhesi groups not willing to compromise on any of their demands? Aren’t bargaining and compromising not the key processes in any negotiation? What forms the basis of the Madhesi stand? The commentary looks into the uncompromising stand as a product of historical, geographic and geo political factors, which have greatly enhanced the bargaining power of Madhesi groups. Being an ethnic minority the Madhesis have always been a marginalized group. The Terai region of Nepal has some of the highest poverty density figures in the country. Due to legal reasons, a large section of the Madhesi population does not have a Nepali citizenship. Forming nearly 40% of the population, Madhesi representation in the Nepali civil service is very low. Taking into account the historical factors, the Madhesis see this as a perfect opportunity to ensure their representation in the political structure. Seeing a golden opportunity, the Madhesis would want to ensure that the new constitution protects them from any form of discrimination that can come up in the future. Geographical division of proposed provinces forms another crucial aspect of the Madhesi stand. The current provincial structure would mean that the Madhesi population is scattered across seven provinces where they would be reduced to a small minority. This would make it very difficult for Madhesi members to get elected into the parliament. They are demanding a revision to the provincial division structure, which would enable them to send more representatives to the parliament. Judging from the reaction to the constitutional amendments, this point seems to be something that none of the Madhesi groups are willing to compromise on. By agreeing to the current provincial division plan, demographic structures would ensure that fewer Madhesis get elected to the national parliament. Ethnic based provincial divisions would mean that the various ethnic groups would find their place in the political process. India factor seems to be the third factor behind the Madhesi stance. Though India has denied any role in the agitation, Madhesi leaders recently travelled to Bihar to meet Nitish Kumar and Lalu Prasad Yadav. The official Indian response to the amendments addressed it as a ‘positive development’ but added, “We hope that other outstanding issues are similarly addressed in a constructive spirit”. The Indian government does have significant control over the Madhesi leaders. India’s indirect support for the movement gives the crucial confidence for the Madhesi agitators to block the vital supply routes, which is causing a severe fuel shortage across the country. 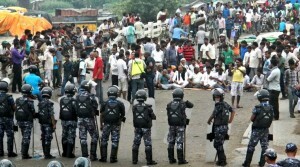 The agitators have understood Nepal’s dependence on this land route and the importance of India as a trading partner. Using their connections to India and Nepali government’s economic dependence on it, the Madhesi agitators have significantly enhanced their bargaining power in the parliament. Historical and geographical factors have pushed the Madhesis to demand for greater concessions. The support they receive from India greatly amplifies their bargaining power. Having had a history of discrimination, the constitution provides the Madhesis with a great opportunity to ensure their integration into the political mainstream. This is an opportunity that the Madhesis are not willing to miss out on. At the heart of their demands is the reorganization of the provinces. The proposed division of provinces means it would be difficult for the Madhesis to secure greater political representation. By not addressing this issue, the constitutional amendments failed to break the deadlock. The constitutional amendments are definitely a positive sign and a step in the right direction. Given the political, historical and geographical factors, more compromises will have to be made if the deadlock has to be broken. The growing shortage of fuel and essential supplies means that there is an increased urgency to put an end to the blockade. From the constitutional amendments to the growing urgency to end the blockade the signs are that a solution would be found soon.